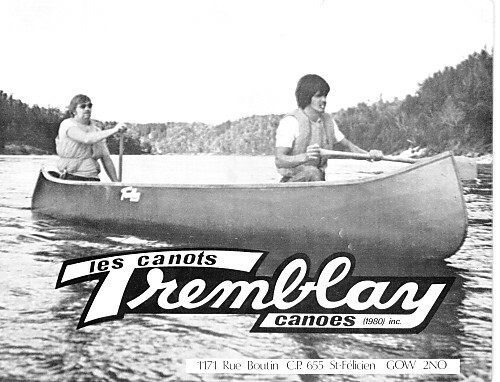 Of the lesser known canoe manufacturers in Canada, Tremblay Canoes Limited (Les Canots Tremblay Limitée) from St. Félicien, Québec stand out from the crowd. 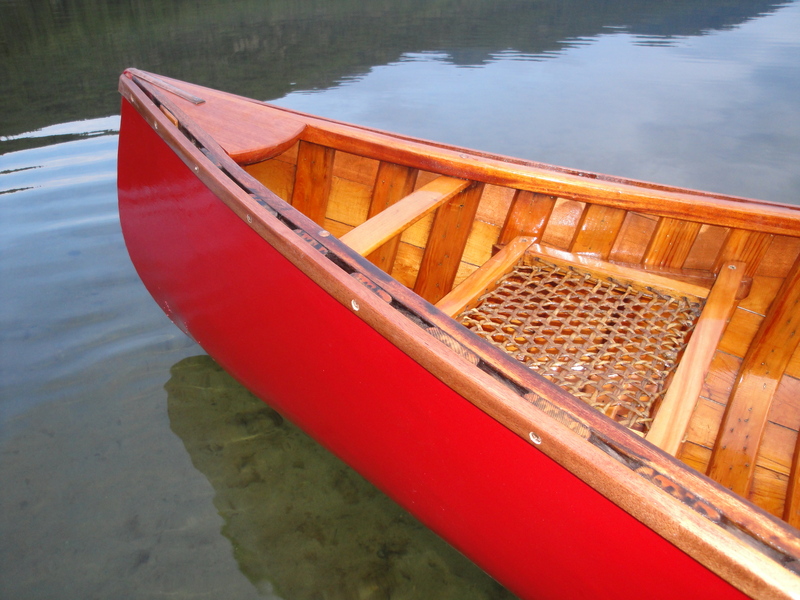 They are well constructed with mahogany trim and their sweet lines make for a lovely paddling canoe. 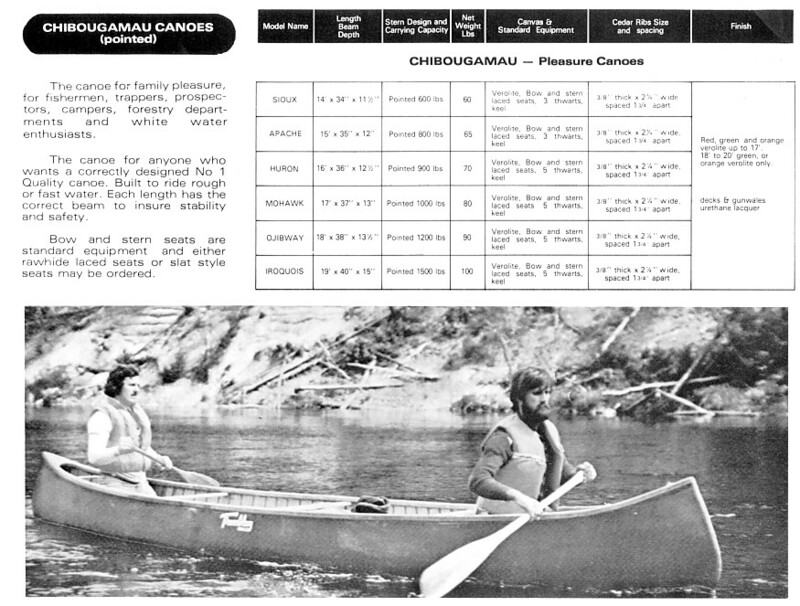 The specifications I present here are for the standard line of canoes produced by Tremblay known collectively as the Chibougamau canoes. There were six canoes in the Chibougamau line ranging in length from 14’ to 20’. 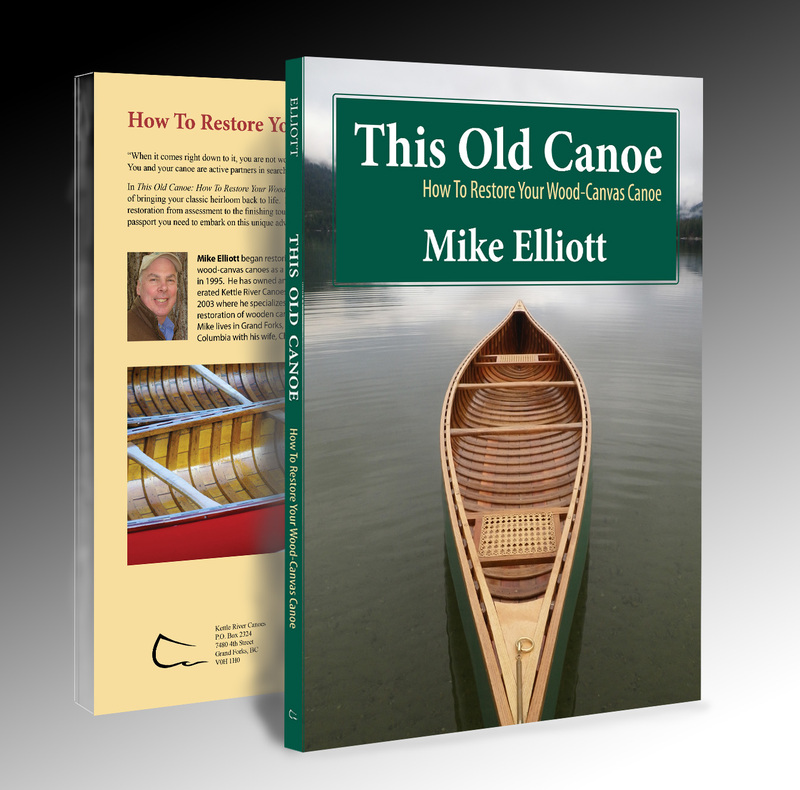 As in all of my blog articles presenting specifications for canoes, I do not present the lines for the hull. 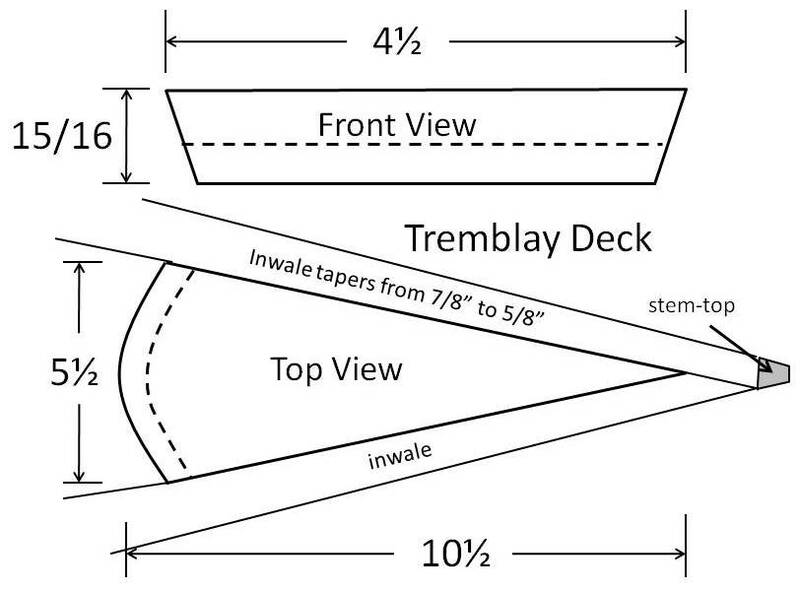 I am presenting specifications for anyone faced with the restoration of a Tremblay canoe. As such, it is not a builder’s guide but rather a restorer’s guide. 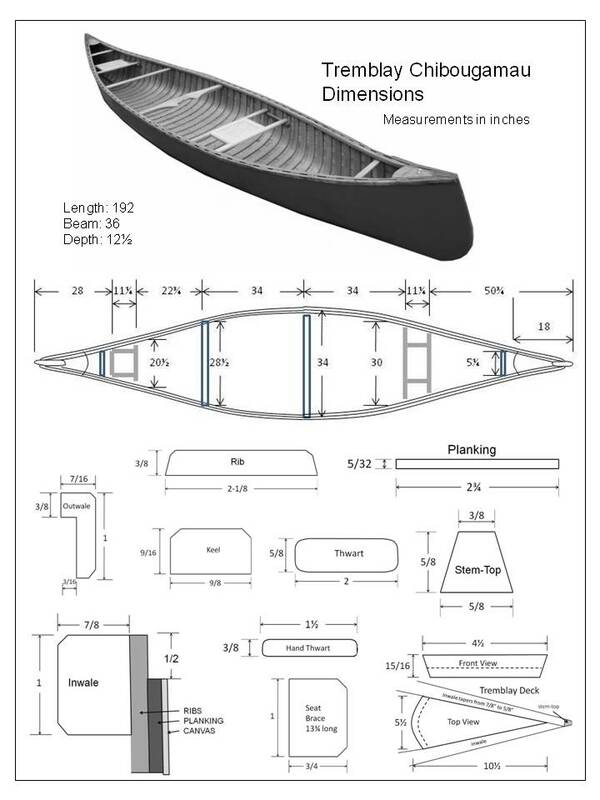 Most of the dimensions can be taken from existing components in the canoe. One little note here: I am listing all of the dimensions in inches. I apologize to all of you who are working in metric. The canoes were originally built with imperial measurements, so I find it easier and more accurate to stick with the original measurements. One more note: In the later years of production, Tremblay canoes were known for their use of vinyl impregnated canvas (Verolite). Although a couple of canoe builders still use this material, I have yet to find a single canoe restorer who will touch the stuff. The vinyl coating acts as a plastic bag wrapped around the canoe and effectively holds water against the hull for extended periods of time. This lack of ‘breathing’ in the canvas cover results in extensive rot through many (if not most) Tremblay canoes that were paddled on a regular basis. Inwales – Tremblay inwales are made of mahogany with nicely rounded edges. The ends curve sharply necessitating soaking the wood and heating the wood with hot water. This facilitates the bend through that section. I have repaired inwales that were cracked through the bend originally. Mahogany is temperamental at the best of times. Outwales – The outwales are also mahogany, but being only 7/16” wide, they do not require heat-bending. For such a thin outwale, they are surprisingly robust. The 3/8” rabbet helps keep the piece stable. Decks – Tremblay usually made their decks from birch or maple, but I have seen mahogany used as well. They are simple in design but nicely finished. 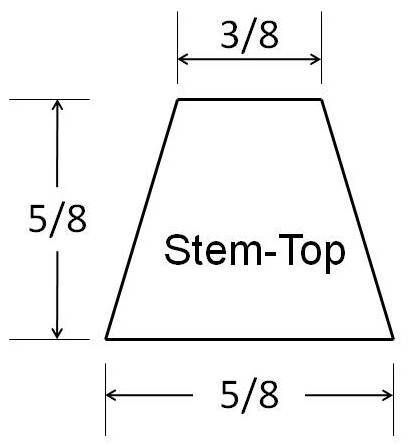 Stem-Top – It is unlikely you will ever have to replace the entire stem. However, I rarely see an original stem-top that is not partially or completely rotted away. The top of the stem-profile is straight thereby making the repair fairly straight-forward. The end assembly is held together with a 1½” #8 bronze wood screw. 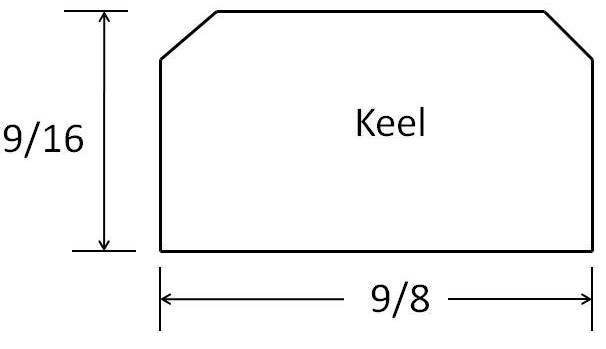 Keel – If you want to keep the keel as part of the canoe, it is a simple piece to make. Use a piece of hardwood and taper each end gradually to ½” wide. It will accept the brass (or copper) stem-band which is ½” wide. 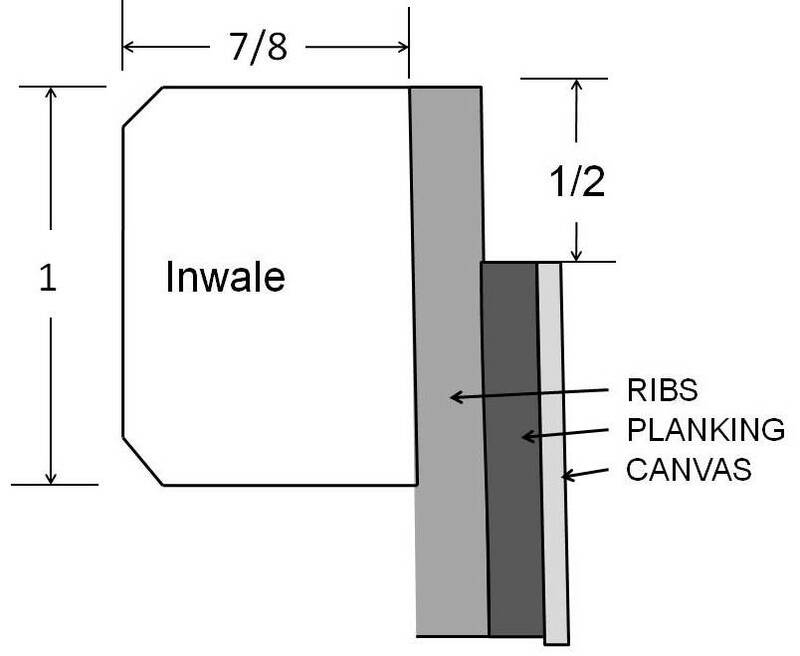 Ribs – The ribs are simple slats 3/8” thick and 2-1/8” wide. The edges are chamfered 10° on both sides with the top cornered rounded off slightly. There are 1¾” spaces between the ribs. Planking – Tremblay did a nice job on the planking. The boards are usually 2¾” wide and 5/32” thick. Seats – The seat frames are made of ¾” birch or maple that is 1-1/8” wide. 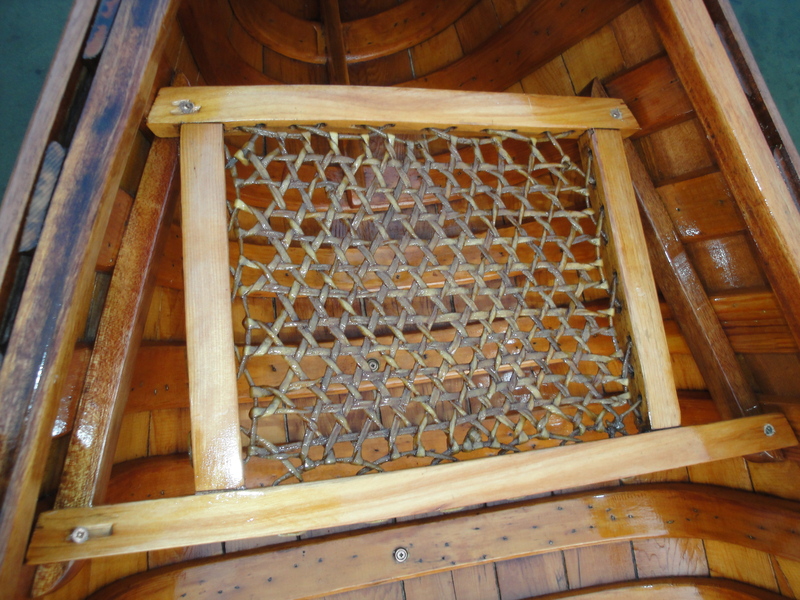 Both seats are attached to mahogany braces on either side of the canoe with 1½” #8 bronze wood screws. 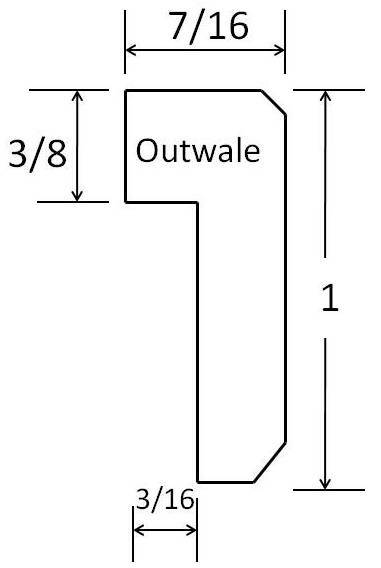 The seats are approximately 2” below the inwale. The body of the seat is laced rawhide done the same way snowshoes were laced. Thwarts – The thwarts are made of 5/8” birch or maple that is 2” wide. They are simple pieces with no taper. They are attached directly under the inwales with steel 10-24 bronze carriage bolts. Portage Yoke – If present in your canoe, you will appreciate the lovely shape of this yoke. It is made of ash 5¾” wide tapering to 2¼” at the ends. Like most designs that are pleasing to the eye, it is also very comfortable to use. Hand Thwarts – These are used as carrying handles on both ends of the canoe. They are positioned about 7” back from each deck. They are made from birch or maple 3/8” thick, 1½” wide and about 13” long with nicely rounded edges. Here is a specification sheet with most of the components on one page.